Discussion in 'Treatments' started by Scarred, Mar 16, 2011. The researchers allowed patients to choose their favorite music, which was then “notched” — a one-octave frequency band, centered on the frequency of the ringing experienced by the subject, was filtered out. After a year, the researchers report in The Proceedings of the National Academy of Sciences, those who listened to this custom-notched music reported a significant improvement in their tinnitus — the ringing was not as loud — compared with others who listened to music that was notched at frequencies not corresponding to their ringing frequency. Wow, thanks for posting. That looks very interesting. I'm going to have to study up on notched therapy. I wonder if I could do the same on "Garageband", my mac music editing app. Jim: I too have GarageBand. Scarred and Markuu, man you guys are good. I just notched a few tracks using your tutorials and will try them out tonight. I have to listen to music all night to sleep so I thought this would be some easy low cost therapy. My tinnitus turned out to be 8200Hz. I think I will check it several more times to see if it is consistent over time. Any updates Jim? Been a couple of weeks, probably not enough time to notice any improvement, but are you still doing this and how's it going? Hi Markku, well I started listening to the notched tracks at night and I noticed right away that they don't provide the same masking/enrichment effect as the full spectrum tracks so they are not as comforting for that purpose. This would be expected of course. I'm really not dedicated to the method and time required to really try and get the benefit from it as suggested might be possible in some of the studies. My tinnitus has actually been quite low for the last couple weeks so I haven't been thinking about it much. If I can just get to sleep at night I'm pretty much good to go. Jim, Are you still listening to notched music? If so, have you noticed any improvement in your tinnitus? Chip, no I haven't continued listening. My T has improved quite a bit over the last couple months, for what reason I do not know, so I have not had the motivation to keep going with the notched tracks. Jim, That's great news! I'm very happy for you. How long did you have tinnitus before it started to get better? Chip, I've had it for about 6 years, the first two were not too bad then it got worse. It's been mostly better for the last 6 months or so. I have no idea why. Still there but not nearly as loud and more of a softer hiss sound, not as irritating. This appears to be genuine, free, and based on real research. Audacity has a function under Generate which can produce white noise if you prefer, instead of notching your music files. Edit: Thanks to whomever moved this into the existing thread; my apologies for not searching first. I'm just wondering if anyone has tried notched white noise. There was another study Lugli 2009, not published by Pantev, that demonstrated a larger effect, with more patients (20) and was a randomized control trial ( www.tinnitusjournal.com/detalhe_artigo.asp?id=48 ). It's also important to note that the notch is much narrower than Pantev's (which was one octave, which is very wide). Lugli 2009 used a notch width of two ERBs ( http://en.wikipedia.org/wiki/Equivalent_rectangular_bandwidth ). It was also effective in patients with a tone of up to 13kHz, as opposed to Pantev, who was only successful up to 8kHz (and shown to not be effective past 8kHz, in another study). Also the aforementioned site was made by my co-founder Peter under the pseudonym John Smith, before we made AudioNotch. 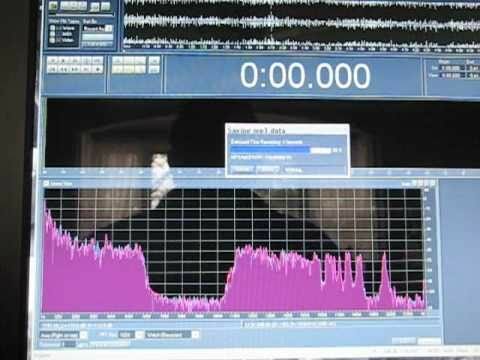 I have T and my tone (the strongerst one) is around 9,3Khz and i I work as a sound guy. I read about this treat and thougt its very easy to try it out. So I took my favorite album "FooFighters Wasting light" and notched 9,3Khz away I listend to it for a day mostly in my speakers (studio nearfield monitors), but also in my headphones, well my T went down a little... If it is a result of my notched music I dont know. I gonna try it out more to see what happens! There is a notched music app in the app store for your iDevices. It's 9.99. Just a FYI. I'd like to add some comments regarding the relative efficacy of Notched Music and Notched White Noise (also, I should preface my comments by declaring that I'm part of a company that provides both of these services to users suffering from tinnitus). Notched White Noise operates on a similar principle to Notched Music, however, broadband noise (white noise) is notched at the user's tinnitus frequency instead of music. From a cursory inspection of the overall methodology behind Notched Music and Notched White Noise, it would appear that the mechanisms are similar: both stimulate the auditory cortex frequencies except for the tinnitus frequency. As a consequence, current theories hypothesize that the lateral inhibitory connections between normal auditory neurons and the tinnitus neurons (obviously I'm grossly simplifying here) are strengthened. Now, I just want to provide a comparison of relative treatment effects. If you read the Pantev papers on Notched Music, the volume reduction he produced was just under 30%. However, if you read the Italian paper on Notched White Noise, the volume reduction significantly exceeded that at 75% at one month. Now, to put these results into context, they have not yet been replicated by other independent studies - and replication is a cornerstone of establishing scientific facts. That said, there is public demand for access to newly published, recently discovered experimental treatments, and we're here to offer that. I hope that this comparison was helpful to all of you. I've personally found that Notched White Noise tends to fade into the background and allow you to focus on whatever work you're doing while you're listening to it (but obviously this depends on the person). I'd like to thank the administrators for granting us permission to make some limited posts in this forum. Certainly we know how frustrating it is as tinnitus sufferers to be bombarded by spam and snake oil - there is no cure, and anyone who tells you otherwise is lying. Is this legitimate? Or is this more snake-oil/scam artistry? Now, our purpose here isn't to spam this forum with identical posts - (I've made that mistake already). Our purpose is to engage the community and answer any and all questions that you may have. I've set it up such that I'll receive notifications if any of you post questions. We sincerely hope that we're able to help some of you. This isn't paid advertisement. Tinnitus Talk doesn't benefit in any way. Well, I was offered a free time limited trial of the service to test and write a review of it on Tinnitus Talk. Later on Jim also got the free review trial, and he's writing down thoughts of the service after he comes back from his holiday. But even before AudioNotch offered the free review trial, I had already offered them the possibility to talk about their service on Tinnitus Talk, noting of course not to go overboard. It's just that Notched Music Therapy is one of possible treatments to reduce tinnitus (or its perception). NMT has been researched and there have been trials too. It's not snake oil like so many other things. I know some might think it's in a grey area to let a company talk about their commercial service here on the forums. This is an exception, and AudioNotch aren't allowed to go overboard with their posts about NMT and their paid service. It's also worth pointing out that one can notch audio free of charge with many sorts of tools available online. AudioNotch.com is just one possibility: some might find it easier to use, etc. I'd like to thank Markku and the team here at Tinnitus Talk for granting us permission to post here. It's definitely important to emphasize that there has been no exchange of funds. We've provided him and his partner with free trials, and that's it. It's clear to us that Tinnitus Talk has carefully managed their reputation by maintaining an appropriate distance from commercial proprietors of treatment - and rightfully so. That's their role as an advocacy group. The team here may very well find that our product didn't work for them, but regardless of what happens, we stand behind the research backing it (we also have no affiliation, financial or otherwise, with the researchers who discovered Notched Music and Notched White Noise). For those of you who are of very limited financial means, I originally created a free site under a now extant google account (https://sites.google.com/site/freetinnitussoundtherapy/home). I was, and still am, a medical student in Canada when I created that site. However, I should be clear that this free version is inferior to our current service. The notch used is very broad (one octave, as opposed to a much narrower notch used by the Italian researchers we've referenced). Furthermore, please note that Notched White Noise has shown a volume reduction three or more times greater than Notched Music. Notched White Noise is essentially the same as Notched Music, but the input is broadband noise (it sounds like static), and in the papers referenced, the Notch was narrower in the White Noise study than the notch in the Notched Music study (which may in part account for the differences in treatment effects). It's also important to note that Notched Music has only been shown to work for those individuals with a tinnitus frequency under 8,000 hZ (check your Tinnitus frequency here http://www.audionotch.com/app/tune/). Although both therapies are similar there are differences (http://www.audionotch.com/FAQ#difference). Does this treatment work if the pitch of the tone fluctuates or changes? notched music but I am not capable of creating it own my own. Can someone help? I mean walk me through it. I know its asking a lot but I would appreciate the help. (Please also be aware, however, that I've since launched a product that provides this service at www.AudioNotch.com for a fee. But you're welcome to try the free walkthrough if you're of limited financial means). Unfortunately, the short answer is - right now, no. At this point, our tuner is only designed for simple tonal tinnitus. We're working on creating a tuner that can create a broader notch, however we're implementing multiple upgrades right now so this is on hold for the time being. Thank you for your interest. Peter, your offering would benefit greatly from tools and techniques that help identify tone pitch, particularly if it's narrow-band white noise. If the band fits within 1 or 2 ERBs, I'd still be willing to try it. As it is, without being able to identify where notching should occur, your product is unavailable to me. I think the difficult part with this type of therapy is identifying the pitch as its subjective, even if the pitch is same tone. But for me the notching part seems easily enough done with a notch filter or parametric eq applied in sound editing software. The plugins are free and probably the sound editing software if not then a free trial anyway. I'm sixty five and do not have great computer skills. I understand the concept of notched music but I am not capable of creating it own my own. Can someone help? Peter's site has great instructions, but if you're still unsure what to do, I am willing to help. The first thing you have to do though, which I cannot help with, is find the exact pitch of your tinnitus. I tried Audionotch and the site is well designed, user friendly with step by step instructions. My problem is that I had a hard time pinpointing the frequency of my fluctuating T and it seems to be over 12K so this does not really benefit me. Has Anybody Try Notched Music Therapy Long Term and Gotten Results? Hi. Just stumbled upon this forum and am glad I did. As you can probably figure out by the fact that I'm posting here, I am, in fact, a tinnitus sufferer. I'm always looking for possible treatments, and I came across something called, as the thread title suggests, Tinnitus Pro Music Therapy by a European company called ProMedical Audio. Here's a link describing it: http://prmac.com/release-id-42135.htm. Quite simply, it sounds interesting, but I have nothing to vouch for it. I called me ENT doctor, but she had no familiarity with it either. I was wondering, then, if anyone here DOES have any knowledge of, or better yet, experience with this product/app? If so, I would obviously love to hear about it. Thanks!